The last few weeks have been a blur of stuffy noses and early bedtimes and endless pots of soup around our house. Winter is here, and she brought with her a marathon of headcolds. This Herbal Sinus Steam has been the only thing luring me out of bed in the morning. Herbal steam baths are an ancient practice used to help ease congestion and moisturize inflamed airways. I have been using a mix of dried eucalyptus, lavender, rosemary, thyme and rose petals to help soothe my poor respiratory system. Eucalyptus and rosemary to break up congestion, lavender to open up airways and calm the nervous system, thyme as a gentle expectorant, and rose petals to soothe dry winter skin. I don’t follow a strict recipe…just a few pinches of this and that until it smells aromatic. Feel free to experiment with different ratios of these herbs, dried or fresh, using whatever you might have on hand. If I’m really congested I will also add a drop or two of eucalyptus essential oil to kick it up a notch. This warm fragrant steam does wonders for a scratchy throat and burning sinuses. A simple healing ritual to sooth the mind, body and spirit when you are under the winter weather. 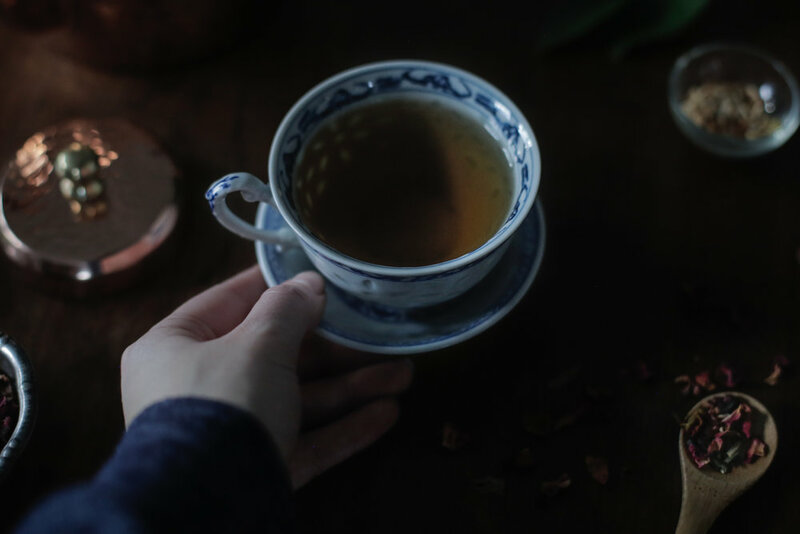 Sending you lots of tea and healing thoughts, dear ones. ***Disclaimer: I’m not a doctor, nurse, herbalist or licensed healthcare practitioner. Some herbs and botanicals are not safe for children, pregnant women, or nursing mothers and may not be suitable to take with certain medications or conditions. This information is not meant to diagnose, treat, cure, or prevent any disease. Always consult your doctor before beginning any kind of new vitamin, herbal, diet, or exercise regime. Make sure to research all of the ingredients to make sure they are safe for you and your family. A few pinches of any of the following herbs (dried or fresh.) Make sure you are only using high quality herbs that haven’t been sprayed with anything. Put a full kettle or pot of water on to boil. While the water is heating up, place herbs in a separate large pot or heat-resistant bowl. Immediately cover bowl with a towel and allow herbs to steep for 5 minutes and the water to cool a bit. Hold your face about 10 - 12 inches above pot. If the steam feels uncomfortably hot, wait a few more minutes for the water to cool then try again. When the steam has reached a comfortable temperature, cover your head and the bowl completely with a towel to make a little tent. Close your eyes to avoid irritation and breathe deeply for 5 - 10 minutes. Try to clear your mind and visualize the healing energy you are inhaling. There's still time, dear ones! We have scoured the Lovely Wild archives for a few of our favorite DIYs this holiday season. From herbal beard oil to hand-painted moon phase flags, each of these simple and intentional gifts can be made in a single afternoon. A lovely excuse to slow down and breathe deep and work with your hands. All you need is a few supplies and a fresh cup of peppermint tea. Oh, and a few inches of fresh snow if you have it. Sending all my love to you and yours, sweet friends. I've been having the strangest dreams lately. Dreams of stones and bones and old forest women. Of moons and mountains and ancient skeleton keys. Dreams heavy with a symbolism I can never seem to untangle. Songs that slip through my fingers the moment after I wake. Perhaps it's the lulling hum of our old ceiling fan. Or the warm breeze fluttering in the bedroom curtains. Or the late summer lightning flashing over the mountains. Whatever it is, it has been pretty magical. There is something undeniably intriguing about the etherial nature of dreams. Perhaps that's why humans have always tried to decode them. To find meaning and symbols amid the bizarre and tangled plot lines. To interpret the images like runes spread upon a table. It makes sense when you think about it...dreams take us to the delicate space between our conscious mind and unconscious spirit. They allow us to peek below the veil. To see what might be lurking in the quiet corners of our psyche. To remember things our soul knows, but minds have forgotten. This Sunday's New Moon in Leo is a particularly auspicious moment to look for the messages hidden in our dreams. The New Moon asks us to set intentions. To turn our gaze inward. To get very quiet and very clear about what it is we are trying to manifest. These simple Herbal Dream Pillows come together in just a few minutes and are a lovely personal ritual to honor the lunar cycle and connect to our subconscious. The herbs listed have been long prescribed by folklore for deep sleep and vivid dreams. To quiet the mind and soothe the spirit. To peek into the space between. Wishing you a dreamy New Moon, dear ones. 1. Start by dip-dying your muslin bag. I used some lovely indigo dye I had rolling around in the back of my craft closet. Follow dye instructions and allow bag to dry. Once dry, I used a small glass to trace the new moon with gold ink. 2. Add your dried herbs to your moon pillow. There is really no precise formula here. Just add small amounts of each herb, smelling as you go until you reach your desired mixture. Follow your nose on this one. Don't forget to toss in a bay leaf or two to inspire prophetic dreams. 3. Place dream pillow beneath your pillow and breathe deep. A fast and furious post for you today lovelies! This little elixir comes to us from one of my very favorite souls - the lovely Kendra Potter of Sistermoon Wellness. Kendra whips up a batch of this fragrant oil for the bearded men in her life every holiday season. My husband has gotten so addicted to the stuff that come November he starts to drop her a series not-so-subtle hints that his supply is running low. It smells warm and earthy and woodsy and romantic all at once. A subtle fragrance for the man who loves the mountains. And if you are a procrastinator like myself, you're in luck! This little gem only takes 5 minutes to mix up. Package it up in a vintage tin with a beard brush or comb and you have a unique and personal handmade gift he will actually use. Happy love day, dear ones! ***Disclaimer: I’m not a doctor, nurse, or licensed healthcare practitioner. Some herbs, botanicals, and essential oils are not safe for pregnant or nursing mothers or children and may not be suitable to take with certain medications or conditions. This information is not meant to diagnose, treat, cure, or prevent any disease. Always consult your doctor before beginning any kind of new vitamin, herbal, diet, or exercise regime. Make sure to research all of the ingredients to make sure they are safe for you and your family. Recipe by Kendra Potter. I used organic oils wherever possible. If you are looking for high quality essential oils, I highly recommend our friends at White Stone Essentials. 1. Add jojoba oil to a small vial. I found that the metal tip of a pastry bag makes a perfect little funnel. 2. Add all oils, feeling free to modify amounts to preference. 3. Close vial and shake well. Use a few drops in beard after bathing. And just like that, it was August. Slowly but surely, summer is slipping quietly out the back door, leaving only a few precious weeks of bursting gardens and heirloom tomatoes and sun-drenched afternoons trailing behind her. I love how everything becomes a little wild this time of year. A little overgrown. Untended. Abundant. Exploding with life. Maybe it's the heat, or the heady scent of jasmine, but these final weeks of summer always makes me a little dreamy. Nostalgic. Less bound to reality. I'm always looking for ways to preserve the last few golden drops of sunshine and squirrel them away for the coming season. 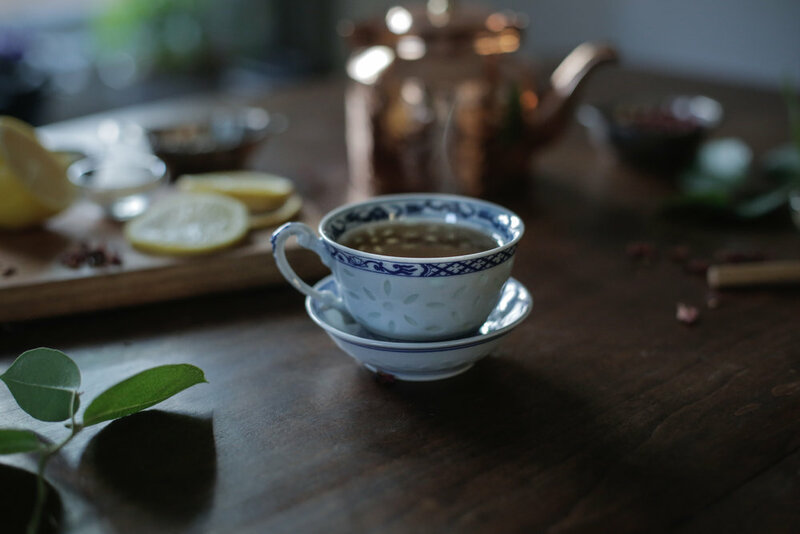 A steaming cup of lemon verbena tea and a jar of wild huckleberry jam can go a long way in the cold dark days of winter. January Hailey is always elated, and a little surprised, that August Hailey had a few fleeting moments of foresight. Distilling a batch of rose water is one of my favorite late-summer rituals. An ancient remedy, rose water can be used in everything from facial toner to teacakes. Cleopatra swore by rose water for supple skin and, according to legend, Michelangelo drank it every morning with his tea. There is old magic in this stuff. I personally like to sprits a little on clean sheets and laundry, or add a tablespoons to bath water if I'm feeling extra fancy. It can even be used in the kitchen to add a delicate floral note to aromatic dishes and sweets, or as a cooling body mist on hot days. The possibilities are endless. A few minutes of time invested now will pay itself back ten-fold when you have this lovely tincture waiting in your apothecary. The key to high quality rose water is (surprise, surprise) high quality roses. Be sure to use only fresh organic roses that have never been sprayed with anything. The more fragrant, the better. This is the perfect project for the rose bush out back that has started to shower her petals. There is something deeply satisfying about finding a second life for fading blooms. 1. Separate the petals from the roses and rinse with fresh water to remove any dirt or insects. 2. Place petals in a large stock pot. 3. Place a wide-mouth jar or ramekin upside down in the center of the pot. This is essentially just used as a base to lift the second jar off the bottom of the pot. Place the second jar right-side up on the ramekin. This jar will collect the rose water. 4. Fill the pot with water until it just covers the rose petals. The collection jar should be above the water line. Place the lid upside down on the pot and heat on medium until the water begins to boil. 5. As soon as the water boils, place ice cubes on top of the upside-down lid. This will help bring the rose-filled condensation to the center of the lid where it will slowly drip into the waiting collection jar. 6. Gently simmer for 15 - 20 mins or until the petals start to lose their color. Be sure not to over-cook, as this will dilute your rose water and change the fragrance. 7. Turn off the heat and let cool for a minute. Using pot holders, carefully remove the lid which will now be filled with water from the melted ice cubes. Gently remove the jar filled with rose water (careful: it's hot!) and quickly transfer it to a waiting receptacle (or just put a lid on the jar.) The lovely rose oil you have just distilled can slip away as vapors so it's important to contain it quickly. 8. Store in a cool dark place until you need a little splash of summer in your life. The new moon asks us to set intentions. To turn inward and greet the part of ourselves we have maybe been neglecting. To take careful inventory and plant the seeds we want to grow. This Friday, May 6th, marks the new moon in Taurus. And this isn't just any new moon, dear ones. It's got a special magic. A knack for manifesting abundance and bringing things into the physical realm. It invites us to take the first step. To write it down. To get really specific about what it is we want. This is fertile ground, lovelies. And for those of us in the Northern Rockies, this new moon ALSO just so happens to hit right smack dab in the middle of our stunning-but-fleeting lilac bloom. Which is pretty much my favorite week of the year. Abundance abounds. Since the new year, I have been marking every new and full moon with a moon bath and I am now totally addicted to the practice. Our deep, century-old porcelain bathtub has become a very sacred spot in our house. A quiet respite to soak and think and meditate and release. To sing and stretch and practice self care. To steep in all the luna love. My moon bath recipe changes from month to month depending on what is in season and what's happening astrologically. 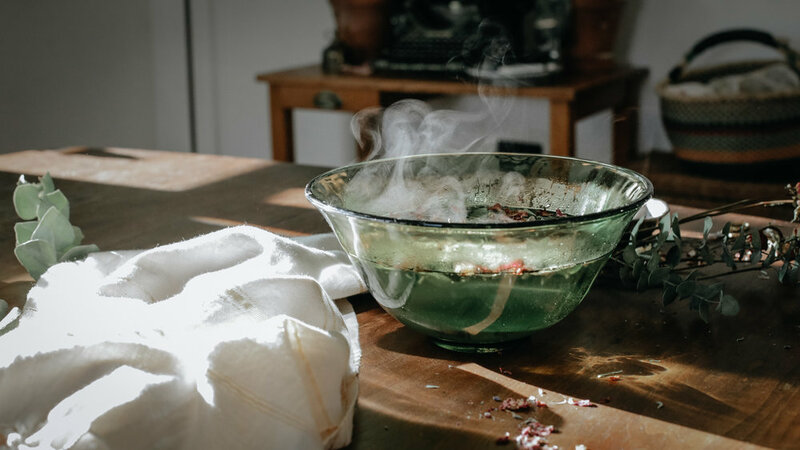 Many of the herbs used in this recipe are prescribed by folklore for purification, release of negative energy and/or manifesting and were chosen specially for the new moon in Taurus. Feel free to substitute or amend this recipe, but make sure to research each herb or flower you wish to add to confirm it is safe to be used in a bath. So tonight, channel your inner Cleopatra and bathe yourself in herbs and petals by candlelight. It's a nourishing way to stay connected with the natural cycles of the moon and to make space to reflect on what you want to manifest in the coming month. Oh, and it smells amazing. Win-win-win. 1. Start by crushing any larger dried herbs with a mortar and pestle. Then tie the sage, lavender, rosemary and bay leaves in a square of cheesecloth. I also added the pink salt to my cheesecloth but it ended up falling out so I wouldn't recommend it. You will use this bundle like a tea bag in the bath. 2. Tie the bundle below the faucet so the hot water passes through it as the tub fills. This will wake the herbs up and infuse the bath water as it fills. 3. As the tub is filling, add 1 to 2 cups epsom salts and 1/2 cup Pink Himalayan Salt directly to the bathwater. 4. Throw in a handful of lilac blooms and bay leaves. You can also add rose petals or eucalyptus leaves. 5. After you have filled the tub, untie the bundle from the faucet and let it continue to steep in the bath water. 6. Light a few candles and turn the lights out. Maybe dry brush your skin if you feel so inclined. 7. Focus on what you would like to manifest. On what you would like to release. Get specific. Breathe deep. Soak in the new moon energy. 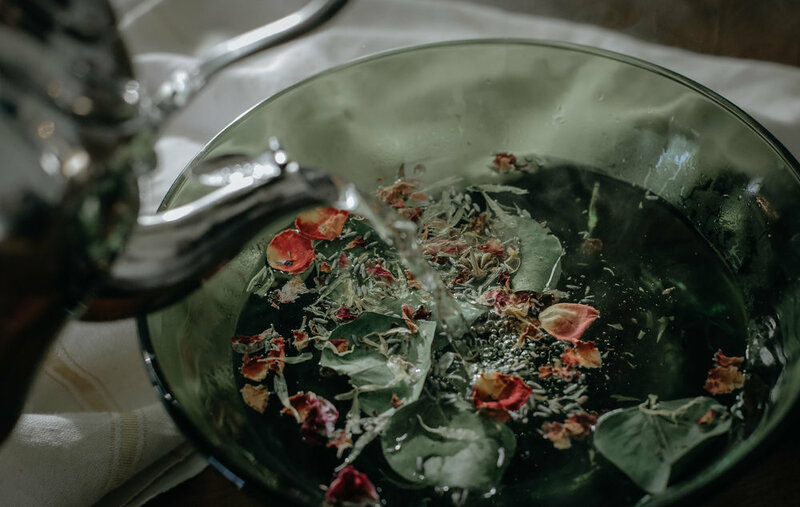 Pro tip: After you have drained the bath, just let any remaining herbs or petals dry in the tub so you can easily sweep them out the next morning. Much easier than trying to clean them out while they are wet. Looking for last minute Mother's Day ideas? Simply use dried herbs instead of fresh and package your custom new moon bath blend in a pretty jar or tube. An easy, thoughtful gift for the lunar goddess in your life. We are still restlessly hibernating here in the mountains of Montana. A fresh six inches of snow over the past few days has dashed any hopes of an early spring and forced us to retreat back to our blankets and books and baths with a general harrumph. For someone who strives to live seasonally and embrace the beauty of each phase, late winter has always been the hardest to love for me. One of my favorite littles recently asked her Mama, "Can we at least pretend it's spring?" I hear you, sister. And yes. Yes we can. But if we can see past the grey, there is also a lovely energy buzzing beneath the surface this time of year. Days are slowly getting longer. Seeds are stirring in the ground, preparing to launch triumphant green shoots when given the word. Animals and humans are rolling over in their dens. It reminds me of that final hour of sleep in the early morning, when you are subtly aware the sun is rising, but still lost in a dream world. I'm using these last moments of rest to indulge in some serious self care. At home spa days have become a weekend staple over here. This Lemon Rosemary Sugar Scrub takes about 5 minutes to make and feels super pampery. I love using lemons in beauty rituals because they are bright and cheerful as well as highly beneficial. They have antibacterial and immune-boosting properties and also reduce the sight of blemishes. Win-win-win. Rosemary is an inflammatory and improves circulation. Also, it smells awesome. Sugar is a great exfoliator and moisturizer. Coconut oil has approximately one million beneficial properties. You are killing like 15 birds with one sugar scrub. Take a few moments to slow down and pamper yourself. You deserve it. 1. Add sugar to medium bowl and squeeze in the juice of one lemon. 2. Coarsely chop the rosemary leaves and add as much or as little as you'd like. 4. Store in mason jars or other airtight container for up to one month. Attn: Head Cold - Your days are numbered.